Cinnamomum camphora (L.) J. Presl (Lauraceae), commonly known as the camphor tree, is one of the most common species in subtropical evergreen broad-leaved forest widespread in southern China, such as Jiangxi, Yunnan, Sichuan, Guizhou, and Hunan Provinces . All the parts of C. camphora contain a special aroma and volatile oil that has been used as a type of insect repellant and an antibacterial agent, and the wood is thought to be ideal for furniture and sculpture . Pharmacological studies have revealed that the plant possesses a wide range of bioactive properties, including antifungal, antioxidant, antibacterial, anti-allergic, and anti-inflammatory [3, 4, 5]. 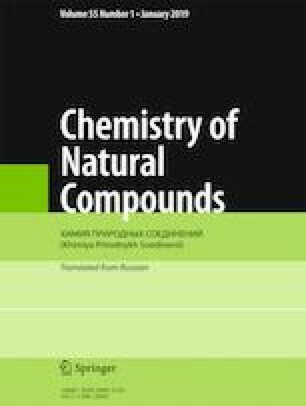 Previous phytochemical investigation of Cinnamomum genus has isolated and elucidated several kinds of compounds, such as natural camphor, essential oil, lignans, flavones, and polyphenols [6, 7, 8]. However, no other literature was concentrated on the secondary metabolites of C. camphora twigs. Published in Khimiya Prirodnykh Soedinenii, No. 2, March–April, 2019, pp. 293–294. This work was kindly supported by State Key Laboratory of Tree Genetics and Breeding (K2017101), Foundation of Key Project of Research and Development Program of Jiangxi Province (No. 20171BBH80017 and 20171ACF60009), the Science and Technology Major Project Foundation of Jiangxi Academy of Sciences (2018-YZD1-05 and 2018-YZD2-18), Science Foundation for Young Doctors of Jiangxi Academy of Science (2016-YYB-07), and Introduction of Overseas Technical and Managerial Personnel Program of State Administration of Foreign Experts Affairs (20173600003), P. R. China.